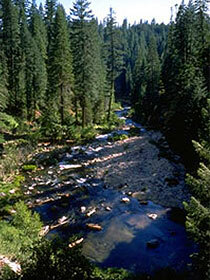 The 94,000-acre FSC certified Collins Almanor Forest is tucked into the Sierra Nevada mountains of northern California. The timberlands were acquired in 1902 and have been managed on an uneven-age, sustained yield basis from the beginning. In 1993, it was the first Collins forest to become certified. Species include ponderosa pine, white fir, sugar pine, Douglas Fir, incense cedar. "The key [to the Collins operation] is selective logging, taking only those trees that are diseased or whose growth rate has slowed, while leaving the most vigorous. There are no clear cuts here, no same-aged rows of trees. The forest floor is "messy" with soil-enriching debris. Loggers are careful to leave any trees with bird nests, even those marked for harvest." Cutting trees and preserving forests can be complimentary goals. As Aldo Leopold wrote in A Sand County Almanac, "It is a matter of what a man thinks about while chopping, or while deciding what to chop." The fact that sustainable forestry is so rare has more to do with management priorities than with any technical challenges the foresters face. Half a continent apart, with radically different terrain. In 1941, the Collins Almanor Forest held 1.5 billion board-feet of timber, enough to build 150,000 homes. Loggers have since removed 1.7 billion board-feet, but the forest has nearly as much wood as it had when logging began, all of it still in mature forest that attracts bald eagles, ospreys, goshawks, and spotted owls.